It has been a very exciting week. I am truly humbled to have been named one of CBC Saskatchewan's 2016 Future 40 for my leadership on digital literacy and digital citizenship in the province. As part of the prize for this honour, I got the privilege of attending a reception with all of the winners in Saskatoon. To get to spend a few hours meeting and talking with the 39 other amazing young leaders in our province was truly inspiring. Thank you to my nominator and to the CBC for selecting me for this honour. 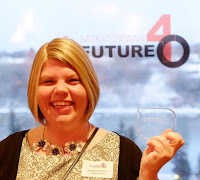 Please check out the other 2016 Future 40 winners on CBC Saskatchewan's website.